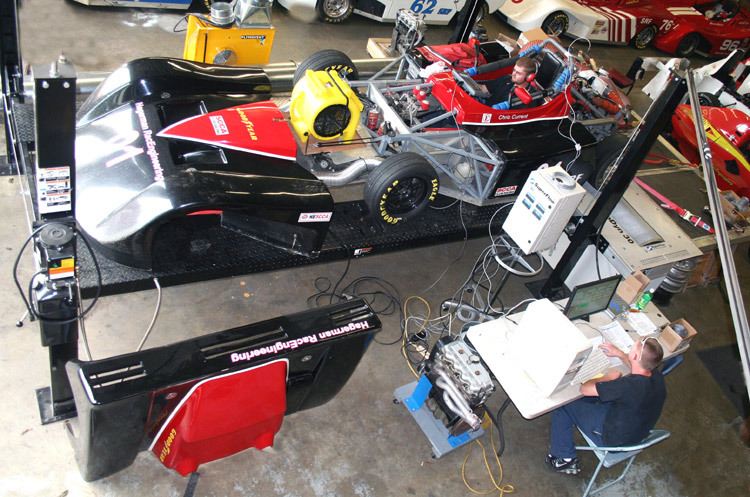 Hagerman RacEngineering has been performing chassis dynamometer testing of Spec Racer Fords for over 15 years. As a result, we have not only developed a feel for how to tune these cars for best performance, but we have generated an extensive database with which we can compare how a car performs in relation to its competition. 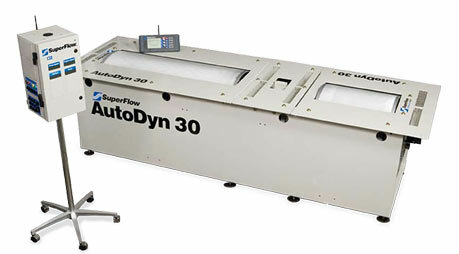 Unlike simple inertia-drum dynamometers, our SuperFlow Dyno features an eddy-current absorber. This allows us to control testing to a much greater extent than dynos without an absorber. We can load the test car at partial or full throttle while holding a steady road speed, allowing us to warm the driveline, tires, and all fluids to a pre-defined level PRIOR to conducting the acceleration runs. This ability ensures that each test run is conducted with the closest operating conditions possible, so the validity of comparing results is dramatically improved; when looking for fractions of a horsepower, this is critical. Testing of the engine without removing it from the car. Engine dynos isolate the engine from the car, while chassis dynos include all of the components actually installed in the car. The effects of the car’s unique fuel system, wiring harness, induction and exhaust systems, and driveline components are all under test. After all, the power at the rear wheels is the bottom line. Engine tuning for performance. We can find the optimum fuel mixture for your engine, and tune the fuel system to achieve that on the track. We can experiment with various standard components (e.g., manifolds, throttle bodies, engine sensors) to find the best match of available parts. We can find the best fuel to run, or what are the best settings for the “spec” fuel, and whether spending $25/gallon for exotic fuels really gains you anything. Baseline and regular monitoring of engine power and torque. We can give you absolute answers on whether that last over-rev really hurt you, and by how much. Is your engine worn out? No more guessing based on leak down numbers. Driveline drag measurements. Perhaps surprisingly, the variation in driveline drag among SRFs at the 2007 Runoffs was measured to be almost as great as the difference between engines (3 HP!). CV joints, brake drag, wheel bearings, and transmissions all steal power that could be used to pass that guy in front of you. Troubleshooting performance problems. Rather than guessing at why the engine was stumbling at the last race and then wasting valuable track time trouble-shooting the problem, we can simulate the load the engine would see at the race track. An hour on the dyno might save a weekend’s worth of frustration! 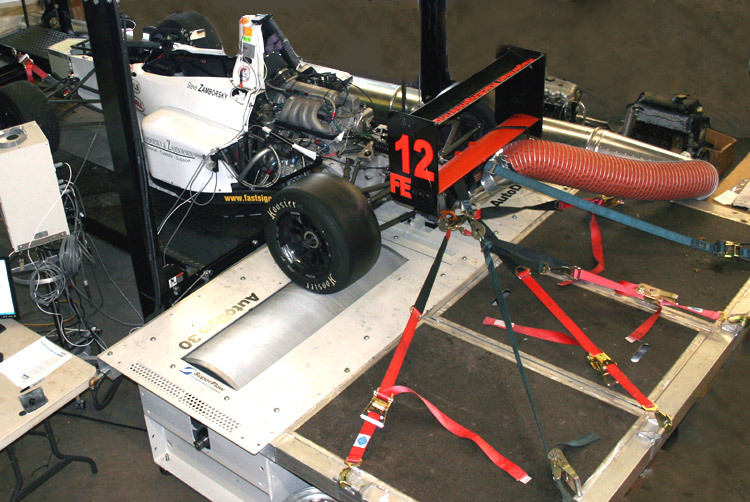 The Hagerman RacEngineering Chassis Dyno - More power to you! Site design and hosting by Shults Dot Com. Copyright © 2001-2019 Hagerman RacEngineering. All rights reserved. Updated: Jan/2019.